Would the Bears leave the nearly century old Wrigley for the suburbs? It doesn&apos;t roll off the tongue very well. But it has to be a consideration as Rosemont Mayor Brad Stephens is making a generous offer to the Cubs and its owner, Tom Ricketts, to acquire 25 acres of land. The team should at the very least feign interest. 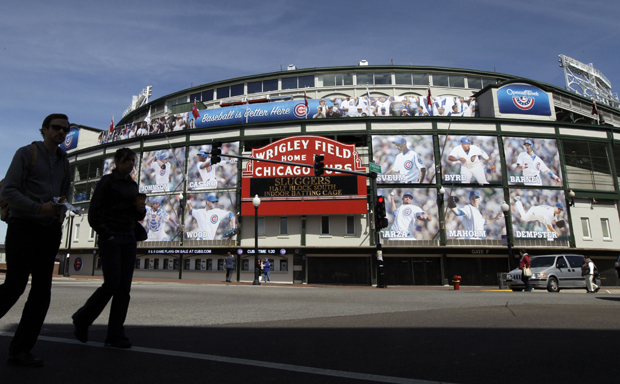 Because it may bolster ongoing negotiations for Wrigley Field and the rooftop owners. It is all politics. And all the fans can do is sit back and watch it unfold. It would not be the first time a Chicago team has tried and to some extent succeeded in using the suburbs and other locations to move. Thirty-eight years ago, Bears owner, George Halas – unhappy with Soldier Field – allegedly had serious talks with Arlington Heights to move the team to the northwest suburbs. The location near Arlington Park race track was more than appealing. With a train station and Route 53 at the doorstep, it was an idle location. A couple of obstacles killed the effort (high bond rate was one). There was also the famous rant from Mayor Richard J. Daley, telling Halas the name Chicago would not be allowed for the Bears if they left the city. It would be curious if the name topic has come up at City Hall about the Cubs. Would Mayor Rahm Emanuel make that same demand on if the Cubs took their bat and ball and move to Rosemont? Papa Halas would threaten to move to South Bend, Ind., and Evanston before inking a long term leasing deal for Soldier Field. As the years went by, the team was still not satisfied with their deal or the condition of the stadium. The public didn’t see the huge cracks in the foundation and the other problems of the lake front venue. Picking up with where his grandfather left off, Bears owner President Michael McCaskey had a land option in Roselle and tried again in Arlington Heights. Other locations included Hoffman Estates, Warrenville and near O’Hare Airport. The zinger by Mayor Richard M. Daley was a good one: “They can go to Alaska.” Not having political allies thwarted those threats for the Bears. The team was rescued by Bears President Ted Phillips after he was able to hammer out a deal with the Chicago political forces that had eluded McCaskey, finally Soldier Field was renovated and reopened in 2003. The team may well have earned political capital when they back-stepped from seeking city financing for Wrigley renovations. However, their political fight is with 44th Ward Ald. Tom Tunney — and wrangling with the rooftop owners is now the main event. Tunney suggested on Wednesday to get rid of Wrigley’s scoreboard was one of the lamest ideas to date. On the South Side of Chicago, the White Sox threat to move to various locations was legendary, Milwaukee, Seattle and Addison. The one location that was minutes from actual coming to fruition was the move to Tampa-St. Petersburg, Florida. Many of us were hunkered down in the press box on June 30, 1988, waiting for the Illinois legislature to vote. The deadline was midnight, at 12:03 a.m., Gov. Jim Thompson strong armed enough votes to keep the Sox in Chicago and get a new stadium. There is no doubt the man that can come to the rescue for the Cubs is Mayor Rahm Emanuel, he could play the same role as Thompson did for the Sox. Meanwhile, the Cubs should use the threat of a move to shake the reality of the situation to the city and the Wrigleyville neighborhood. Do the Cubs need the city and the nearly one hundred year old stadium to retain popularity? Or would a move to the ‘burbs with a new stadium near a hub of expressways and public transportation with the opportunity to make millions more dollars in revenue be intoxicating to the Ricketts and the Cubs? The team’s deadline for a deal is coming soon-Opening Day-April 1st no fooling.